The EU’s fiscal oversight mechanism, the Stability and Growth Pact, which sets limits on states’ budget deficits and debt levels, was insufficient to prevent the Eurozone crisis from occurring. Nicole Rae Baerg notes that if European states are to learn from this failure, it is important to understand why the system lacked credibility. Presenting evidence from a recent study, she writes that larger and more Eurosceptic states have received weaker levels of oversight from the Commission than smaller states, and that the ability of more powerful states to alter Commission recommendations should be a key area of concern for policymakers who would like to see credible European safeguards put in place. While reports of budget assessments for the Member States of the European Union rarely make headline news, government budgets and budget assessments are essential for understanding the euro crisis. The EU’s member states, either bilaterally or jointly, have provided financial assistance (or ‘bailouts’) to five countries in the Eurozone since 2010, suggesting that the system of fiscal oversight in the EU has failed. An important question, therefore, is who (or what) is to blame? In a recent study (coauthored with Mark Hallerberg) I have assessed one particular part of the system that was critical in diminishing the fiscal oversight mechanism of the EU. We focused on how particular countries, such as ‘large countries’ (France, Germany) and ‘Eurosceptic’ countries (the UK), contributed to the euro crisis. Our general finding is that large and Eurosceptic countries can more easily ‘water-down’ the fiscal oversight mechanisms of the EU by weakening and editing the Commission’s recommendations (or texts) against them. The failure of the EU’s fiscal framework did not stem from the lack of an appropriate system at the European level. The system was in fact quite detailed and elaborate. The European Union had a set of rules on budgets. It expected that the budget deficits of member states would not be worse than 3% of GDP and that gross debt burdens would not be larger than 60% of GDP. In addition to the formal rules, there were also regular procedures to monitor all member states and, where there were repeated violations of the rules, there existed procedures that defined punishments. The executive branch of the European Union, the European Commission, served as a watchdog. The Commission drafted annual reports that pointed out where governments were going wrong. The reports also sometimes suggested corrective measures, and the Commission could threaten to initiate a punishment, which ultimately could include a fine for failing to abide by the rules. Yet, despite this system of rules and oversight, Greece has run deficits above 3% every year from the time it joined the euro in 2001 until today. Similarly, France and Germany first broke the rules in 2003. Most recently, the European Commission granted countries such as France and Spain (as well as others) additional flexibility in meeting their deficit target. Despite this break, Spain missed its deficit goal for the eighth consecutive year and France continues to stall its politically contentious reforms. While the European Commission has proposed recommendations to each state, the member states collectively have had to approve the final report or text. This has ensured that there has been an opportunity for the member states to propose changes to the monitoring of their performance and, together with a minority of other states, to block the original Commission recommendations. In order to measure when and how much this has occurred, using both human coding and textual analysis, we compared the initial Commission proposed recommendations (or text) to the final text after the member states had a chance to change it. Our results indicate that changes to the Commission’s recommendations were common. Moreover, the direction of the change was usually to weaken the text – about 30% of the time over the period 1998-2012 the member states received weaker final texts. This evidence suggests that once the member states managed to get hold of the Commission’s texts, the EU’s economic governance structure, and especially its ‘watchdog’ function, became undermined. Yet the changes to the texts were not the same for all countries. France, Germany, and Italy had the most frequent ‘edits’ of their texts. And, while France and the UK had common ‘weakenings’ of their texts, Denmark and Luxembourg did not. The first explanation for this is that, in accordance with Juncker’s remark above, the large states such as France and German have experienced more changes to potentially critical reports than small states. This suggests that the EU rules apply more to some states (Spain, Ireland, and the Netherlands) than others (France, Germany). 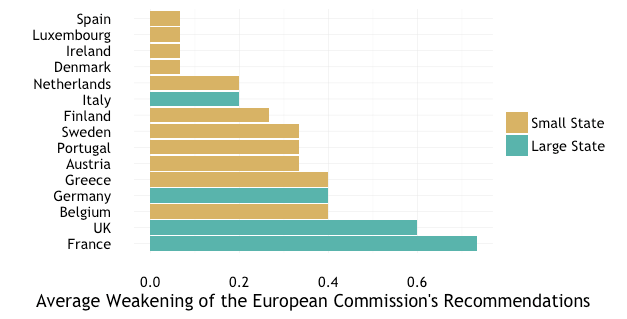 In order to see this visually, the chart below shows the average ‘weakening’ of European Commission texts for each member state in our sample. The greater the score on the horizontal axis, the more a state’s recommendations were weakened on average. As can be seen, while countries might not push every year for a weaker final assessment, larger member states are more likely to weaken their text than smaller member states. Note: The higher the score the more recommendations were weakened on average. For more information, see the author’s accompanying journal article. Our second finding is perhaps less obvious. Member states with less domestic support for the European Union also exhibit more changes to these reports in their favour. Where the audience is generally sceptical of the European Union, the message that ultimately comes from Brussels to a given government will be watered down. The UK exhibits similar weakening patterns as Germany and France, and further analysis suggests that it too has disproportionate power when it comes to weakening the Commission’s texts. The European Union has strengthened its rules since the crisis. Yet our findings have two implications for the functioning of the system today. First, large states will probably still get their way. This is indeed what one observes during the last two years. France and Italy, for example, continue to have difficulties getting their deficits below 3% of GDP and the Commission seems to be politically motivated to ‘turn the other cheek’. Despite tougher rules, they have little trouble avoiding deep austerity measures to lower their deficits. Second, the European Union in general has become more Eurosceptic. Following the UK’s decisions to leave the EU, we might very well see the fall out of growing Euroscepticism. Intriguingly, a member state may be able to get more from an international organisation by having a sceptical domestic audience; yet as the UK illustrates, being too sceptical may mean foregoing potential benefits if that scepticism ultimately pushes the given state out of the organisation. Now that the UK has chosen to leave, the disproportionate level of power that the UK enjoyed will likely disappear. Our evidence suggests that those countries outside the euro are no more likely (or able) to weaken and edit the Commission’s texts. Finally, the crisis of confidence in the EU’s fiscal governance structure appears to be self-fulfilling. The German finance minister, Wolfgang Schäuble, recently suggested that member states should bypass the European institutions altogether. He argued that peer pressure from other states, rather than the EU’s apparatus, should enforce the rules, and that the EU mechanisms of fiscal oversight are insufficient. Our findings leave little room for optimism as to the capacity for European rules alone to be effective in reducing existing debt burdens. This is all the more likely as Euroscepticism reaches new highs across Europe. The efficacy of the EU’s economic governance system is, after all, what member states, encouraged by their citizens, make of it. Nicole Rae Baerg is an Assistant Professor in the Department of Political Science at the University of Mannheim and, starting October 2016, in the Department of Government at the University of Essex. She works on fiscal and monetary policy as well as immigration.